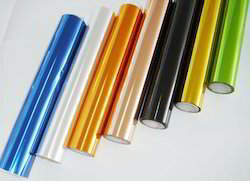 Prominent & Leading Exporter from Mumbai, we offer plastic foils. With the help of our highly skilled professionals and by using advanced manufacturing techniques, we are manufacturing, exporting and supplying an exclusive range of Plastic Foils. This range of foils is accessible in an extensive spectrum of sizes as per the details given by our clients. These foils are designed by our highly proficient professionals by using high quality material and contemporary technology at our end. We are also giving these foils at nominal rates. Looking for Plastic Foils ?